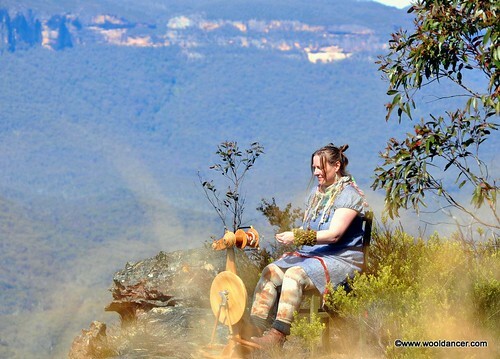 Michelle is acclaimed among international fibre art circles for her unerring inquiry into the art of handspun yarn creation. As a full-time fibre artist, Michelle innovates thread constructions, designs neckwear, pushes the boundaries of how thread is formed and brings the process to students around the globe via hands-on workshops. Michelle's expressive yarns bring a vibrant, modern twist & fresh design to her wearable accessories. Every step of the making process is nurtured by the artists hands. Here in the website shop you may browse Michelle's creations, purchase a one-off timeless piece, take a workshop or simply be inspired by her process of making extraordinary artisan yarn. "It begins with making extraordinary yarn, expressive threads ebb & flow and loop together, creating a luxurious tactile experience for the wearer. Each yarn I spin is a one-off work of wearable art. Hand-crafted yarn holds a story, telling threads become a metaphor for life's journey.. every inch of yarn undulates with a living rhythm to create individual expressive works, as well as functional wearable garments, beanies, & textile jewelry, gifts of pure warmth from my hands to yours. Sustainable materials, processes and techniques are the driving-ethos behind my studio practice. Wool is sourced both locally & organically where possible from Aussie farms, Peace Silk is harvested only when the moth has completed it's full life-cycle, dye colours are organic, and I personally produce each item every step of the way from fleece to fashion using the humble spinning wheel. Viva la Handspun Revolution!